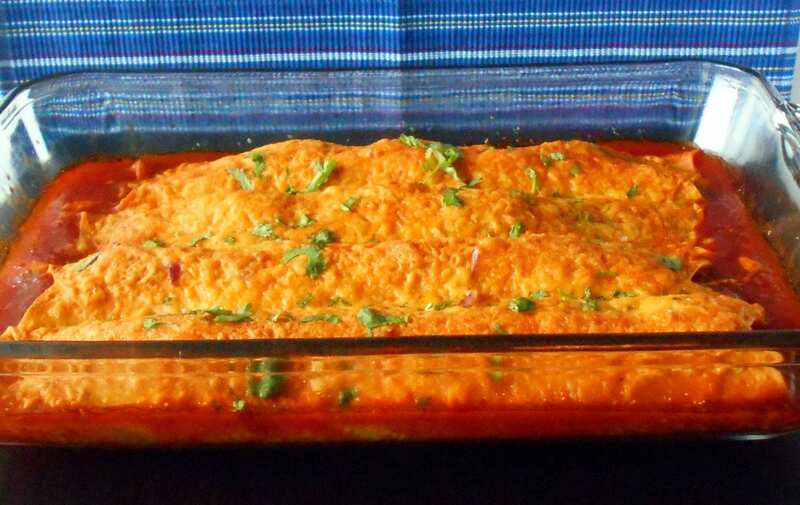 If you are looking for a quick weeknight dinner, this vegetarian enchilada is perfect. It comes together in under 30 minutes and requires minimum effort. There are days when I just don’t want to cook! You know the days I am talking about, right? The traffic was a nightmare and you had a tough day at work. Once in a while, it is ok to not cook a dish from scratch. 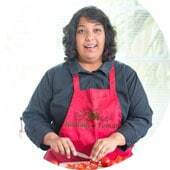 For me, I spent the holiday season cooking up a storm and I couldn’t bring myself to cook a huge meal yesterday. Personally, I am taking a vacation from my kitchen. There is going to be a lot of take-out for the next couple weeks. I give you permission to take a vacation too! This vegetarian enchilada recipe is quick and fast. It will guarantee that you won’t be in the kitchen for more than thirty minutes. I have often been asked to make recipes for college students, who neither have the time nor the energy to cook from scratch. Not to mention, they have flies in their wallet where there should be money. 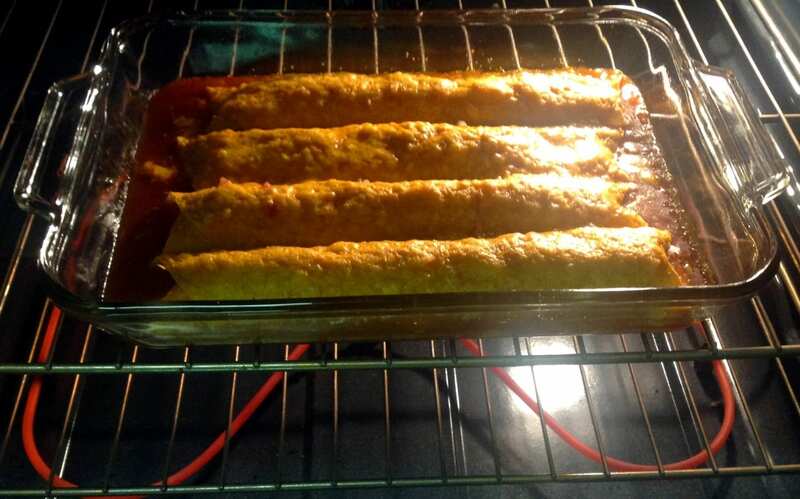 So, this vegetarian enchilada would be perfect for them because they are using cheap ingredients to make a healthy, fulfilling recipe. I like adding tomatoes to this recipe. Cherry tomatoes make a great addition to the recipe and also give it a little healthy flare. When you bite into this tomato, your vegetarian enchilada gets a whole new level of wonderful deliciousness. I like to marinate the tomatoes with oil and some of that taco seasoning. Also add onions to your vegetarian enchilada because it will add a crunch to your dish. Can you imagine the burst of flavors when you bite into this? 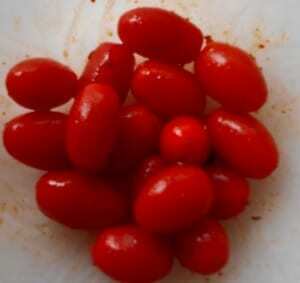 The spicy beans, the onions and the tomatoes make for a wonderful taste. In a baking dish, the large tortillas sit nice and snugly. These is important because they cook faster when they are together. They give their heat to the other and vice versa. Now, comes the best part! The CHEESE! 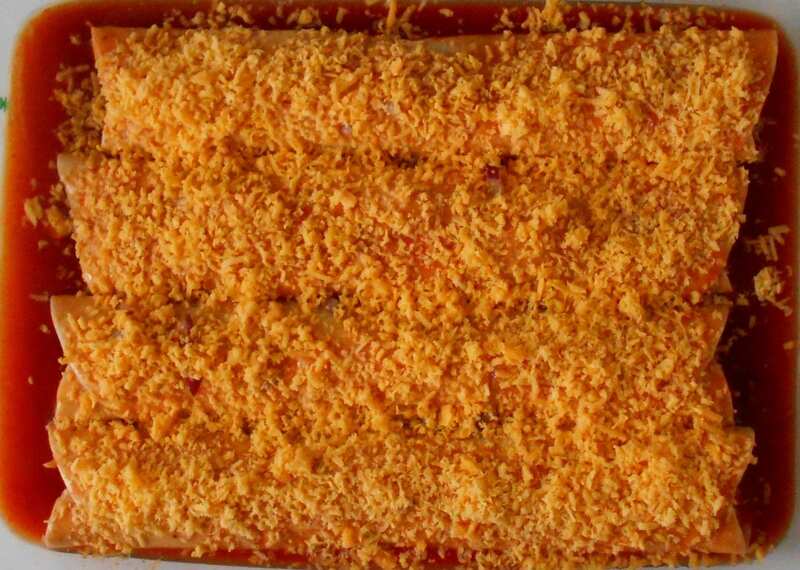 Sharp cheddar cheese is so awesome in this recipe. I have experimented with several other cheeses for this recipe and nothing comes close to this cheese. It adds a wonderful sharpness to the vegetarian enchilada. 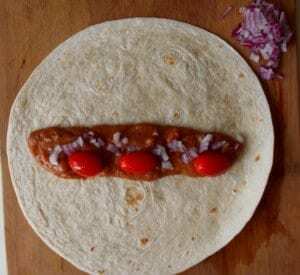 Combined with tomato, onions and beans, you will be in heaven with your first bite! So, are you planning to get take out for the next few weeks? 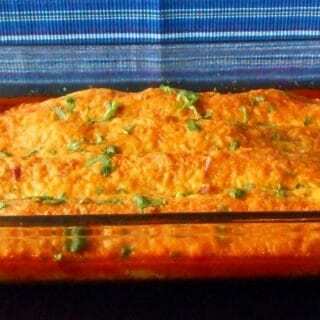 Quick weeknight vegetarian enchilada recipe for the whole family. Spray the baking dish with cooking spray or you can oil it. 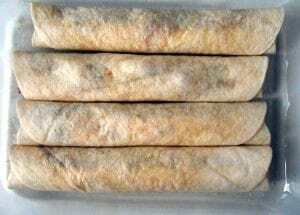 Roll them up tightly and place it on the baking dish. Keep a side of the enchilada sauce for your guests. We all need these shortcut recipes throughout the year! 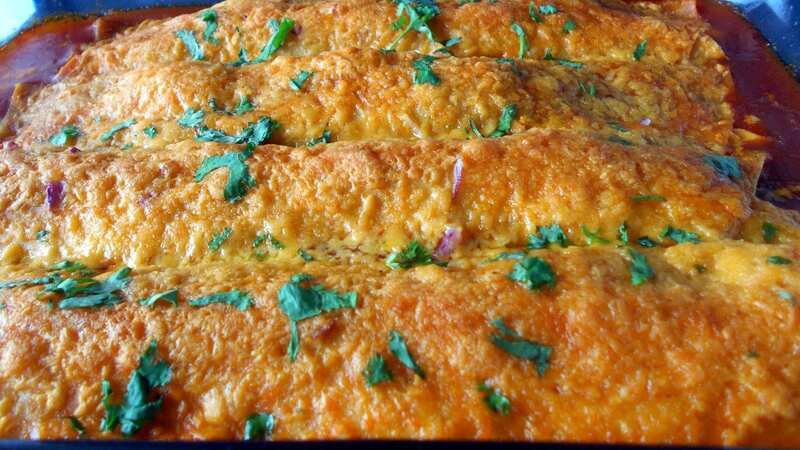 Your vegetarian enchiladas look terrific. I’m making split pea soup for the hubby and am going to use the seasoning packet that came with the peas…easy and tasty! Good Idea! I always put away the seasoning packets and hope to use them somewhere else. Thank you for liking my enchiladas. Great! I am hungry for pizza too! Hope you had a great pizza outing. Thanks. I can SO relate to wanting some time away from the kitchen. In addition to the holiday cooking, my (very) elderly father-in-law is staying with us and he wants 3 cooked meals a day. He’s been gone all week for his birthday (93) and I have done NOTHING but tidy up and rest. I would love this really easy dish. I’m not sure we can get all those ingredients here in Australia but I’ll look. The enchilada sauce is the one iffy thing. Maybe I could make that and go lazy on the rest of the stuff. Thank you Maureen. I feel for you! It cannot be easy cooking 3 meals a day for you father-in-law. I am glad that you have 1 week off. If I was in Australia, I would totally lend you a hand. It must be hard cooking so much and then having time for blogging and social media. My chef hat off to you! This looks very delicious.I do “kitchen vacationing” sometimes too. I do this on Sundays when we go for Chinese buffet ( so bad for the waist) . 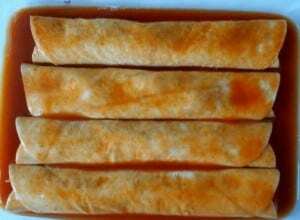 This enchilada is really a great idea. It does looks very easy to make. Love the simple no-cook filling! These look delish! Thank you so much Becca. I am so glad you liked it.